French President-elect Nicolas Sarkozy will meet with German Chancellor Angela Merkel in Berlin on Wednesday 16 May. It will be Sarkozy’s first meeting with a foreign head of state as President of France. Sarkozy will take office in a ceremony in Paris earlier in the day. RTL/AZ Media provide both tape and live facilities from the studio. 14.05.2007 French President-elect Nicolas Sarkozy will meet with German Chancellor Angela Merkel in Berlin on Wednesday 16 May. It will be Sarkozy’s first meeting with a foreign head of state as President of France. Sarkozy will take office in a ceremony in Paris earlier in the day. 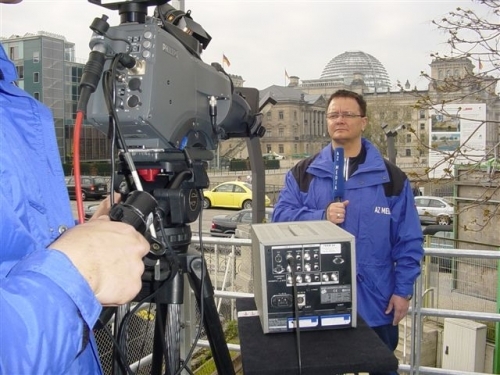 RTL/AZ Media provide both tape and live facilities from the studio.